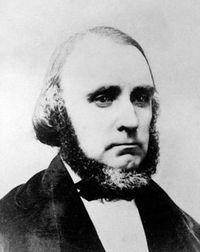 William H. Clayton (July 17, 1814 – December 4, 1879) was an early leader in the Church of Jesus Christ of Latter Day Saints who was a clerk and scribe to the religious leader Joseph Smith. Clayton, born in England, was also an American pioneer journalist, inventor, lyricist, and musician. Clayton was born in Penwortham, Lancashire, England, the son of Thomas Clayton and Ann Critchley. He was the eldest of 14 children. He married Ruth Moon on October 9, 1836. In 1837, Clayton investigated the Church of the Latter Day Saints. Taught by church apostles Heber C. Kimball and Orson Hyde, Clayton was baptized October 21, 1837; ordained a priest in December; and a high priest on April 1, 1838. Clayton's parents and siblings also joined the church. Clayton quit his job as a factory clerk to devote his time to missionary service in England, where he founded a branch of the church in Manchester. In 1838, he served as second counselor to the British mission president Joseph Fielding, with Willard Richards as first counselor. We have had the privilege of conversing with Joseph Smith Jr. and we are delighted with his company. We have had a privilege of ascertaining in a great measure from whence all the evil reports have arisen and hitherto have every reason to believe him innocent. He is not an idiot, but a man of sound judgment, and possessed of abundance of intelligence and whilst you listen to his conversation you receive intelligence which expands your mind and causes your heart to rejoice. He is very familiar, and delights to instruct the poor saints. I can converse with him just as easy as I can with you, and with regard to being willing to communicate instruction he says, "I receive it freely and I will give it freely." He is willing to answer any question I have put to him and is pleased when we ask him questions. a member of Joseph Smith's private prayer circle where the Latter Day Saint temple ceremonies were first introduced. In 1843, Smith dictated a revelation on plural marriage to Clayton. As the practice of polygamy was initially secret, Clayton spent time dealing with rumors and innuendo about the practice both in the church and surrounding community. [ citation needed] he accepted plural marriage as a religious principle, and ultimately married nine wives and fathered 42 children. Three of his wives later left him. Clayton's impressions of day-to-day activities, recorded in a series of personal journals, describe the social activities of mid-19th century America and the evolution of Mormon religious culture. After Smith's death, Clayton helped complete Smith's official church history, using his personal journals as a major source. Clayton's personal records were at times incorporated into official Mormon scripture and history without recognition of their source. [ citation needed] His notes were one of four sources used to reconstruct a sermon by Smith known as the " King Follett Discourse". Published sections of Clayton's journals also provide a detailed description of the Nauvoo Temple and an account of the Latter Day Saints' efforts to complete temple endowments for all interested members before being forced to leave Illinois. Early in February 1846, Clayton left Nauvoo with the first Latter Day Saint group in their exodus to the West. He spent the winter of 1846–47 at Winter Quarters, Nebraska. The following year, he was a member of the vanguard company that crossed the plains to select a western site for Mormon colonization. He was a recording scribe for Brigham Young, President of the Quorum of the Twelve Apostles, during the journey. The group traveled along the Platte River into present day Wyoming territory and crossed the continental divide, ultimately reaching the Great Salt Lake Valley in modern Utah. Clayton's pioneer journal, later published, is the most well-known account of the expedition. He noted that land in the Salt Lake valley would be easy to clear as it had limited timber, and expressed concern over the apparent scarcity of rainfall. Clayton later prepared and published The Latter-day Saints' Emigrants' Guide, a meticulous description of the route from Winter Quarters to Salt Lake City, with suggestions for camping places. Using his odometer, the guide had the most accurate distances of the day. It was a valuable guide for Mormon migrants, but was also used by pioneers bound for the Oregon and California territories. In April 1846, while camped near Locust Creek on the plains of Iowa, Clayton wrote the words to the popular Mormon hymn, now known as " Come, Come, Ye Saints", which is sung to the music of a traditional English song, "All is Well". The hymn was in response to good news from Mormons still living in Nauvoo. One of his plural wives, Diantha, had given birth to a healthy baby boy, William Adriel Benoni Clayton. In his journal, he stated that he "composed a new song—'All is well.' I feel to thank my heavenly father for my boy and pray that he will spare and preserve his life and that of his mother and so order it so that we may soon meet again." To modern Latter-day Saints, this hymn signifies the difficulties and faith involved in the Mormon migration to the west. Some of Clayton's other poems have also been put to music, including "When First the Glorious Light of Truth", also used as a hymn by the LDS Church. Clayton is credited with inventing a version of the modern odometer, during this trip across the plains from Nauvoo, Illinois to Utah, with the help of apostle and mathematician Orson Pratt. Clayton was assigned to record the number of miles the company traveled each day. This was accomplished by tying a red flag onto one of the wagon wheels, and counting the revolutions. After three weeks, Clayton tired of personally counting the revolutions of a wagon wheel and computing the day's distance by multiplying the count by the wheel's circumference. After consulting with Pratt, he developed a design consisting of a set of wooden cog wheels attached to the hub of a wagon wheel, with the mechanism "counting" or recording by position the revolutions of the wheel. The apparatus was built by the company's carpenter Appleton Milo Harmon. Clayton's journal records: "About noon today Brother Appleton Harmon completed the machinery on the wagon called a 'roadometer' by adding a wheel to revolve once in ten miles, showing each mile and also each quarter mile we travel, and then casing the whole over so as to secure it from the weather." The "roadometer" was first used on the morning of May 12, 1847. Once settled in Utah, Clayton continued to maintain church records and also participated in public and private business activities. He became an auditor for Utah Territory, as well as recorder of marks and brands, holding both positions until his death. Clayton also worked as treasurer of the Deseret Telegraph Company and as secretary of Zion's Co-operative Mercantile Institution (ZCMI), a church based cooperative business enterprise. Private ventures included collecting debts, filing land claims, acting as a legal advocate, lending money, merchandising, farming, and mining speculation. Clayton was active in cultural activities in the Salt Lake Valley, particularly those associated with music. He died in Salt Lake City on December 4, 1879. He was buried at Salt Lake City Cemetery. ^ Biography of William Clayton, The Joseph Smith Papers. Accessed December 21, 2011. Allen, James B. and Glen M. Leonard. The Story of the Latter-day Saints. Deseret Book Co., Salt Lake City, UT, 1976. ISBN 0-87747-594-6. Cracroft, Richard H. "Oh, What Songs of the Heart": Zion's Hymns as Sung by the Pioneers," included in Walker, Ronald W. and Dant, Doris R., "Nearly Everything Imaginable: The Everyday life of Utah's Mormon Pioneers," 1999, Brigham Young University Press, Provo, Utah. ISBN 0-8425-2397-9. Jenson, Andrew (1901). "CLAYTON, William". Latter-Day Saint Biographical Encyclopedia. 1. Salt Lake City, Utah: Andrew Jenson History Company. pp. 717–8. Smith, George D., editor. An Intimate Chronicle: The Journals of William Clayton Signature Books, Salt Lake City, 1991. ISBN 1-56085-022-1. Clayton, William (1848). "The Latter-Day Saints' Emigrants' Guide". St. Louis: Chambers & Knapp.